Section F: Statement of Requested Confidential Treatment of Materials Submitted. [For sponsored TLDs, this part of the application is to be completed by the sponsoring organization. For unsponsored TLDs, the registry operator should complete this part of the application. Please refer to the Detailed Application Instructions for more information on the requirements for new TLD applications. 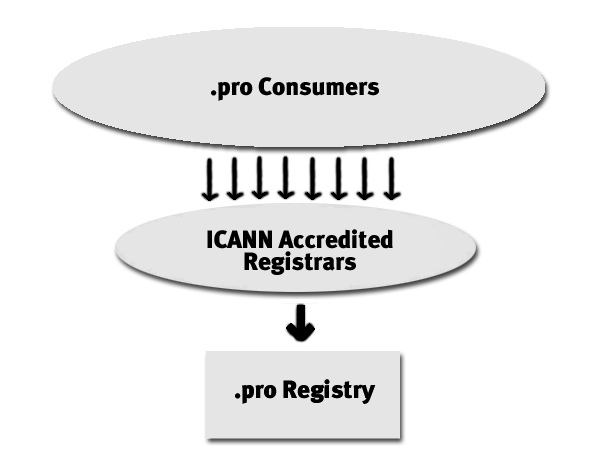 RegistryPro intends to comply with and help support ICANN policies, including those in the above agreements and others produced by consensus.� Additionally, RegistryPro proposes a range of policies to guide the creation, implementation and maintenance of a trusted new TLD and create best practices for all registries.� This proposal for a restricted TLD offers a number of unique features that will enhance the domain name system (DNS) and Internet usage for consumers. RegistryPro proposes technical systems that will improve trademark protection beyond the capacity of current systems.� We will develop an enhanced database system with expanded search functions (Whois plus, an enhanced Whois as described in our responses to questions E5.6 and E7) ruled by specific policies geared toward greater protection of intellectual property. RegistryPro proposes a community refund that contributes a portion of Register.com's and Virtual Internet's registry profits to promote stability within the DNS and encourage competition among registrars. From the outset RegistryPro will look to an Advisory Board to assist with the development and implementation of these plans. RegistryPro will form the Board from among ICANN constituencies, professional organizations, as well as respected experts in the domain name space.� Where references to an Advisory Board appear below, please see our response to question E10 for a description of its proposed role and composition. For format requirements for TLD strings, see the answer to FAQ #5. The Usefulness of .pro to the DNS. Although the proliferation of the Internet as a means of communication and commerce has vastly expanded the ways in which� business and personal matters are conducted, it has not been without certain perils and pitfalls.� Credit card fraud on the Internet has reached heretofore unknown levels.� Cybersquatting has cost well-known brands and trademarks hundreds of thousands of dollars.� Even legitimate duplication of names has bred confusion within the DNS.� Consumers are finding it more and more difficult to find what they are looking for on the web. In over 1000 people surveyed by RegistryPro to test the viability of .pro, 51% indicated a level of frustration in attempting to locate information online, indicating that they were either overwhelmed with pages and pages of search results or needed to redo/refine their searches. The addition of .pro as a new, restricted TLD will simplify and segment the use of domain names in a logical and ordered fashion.� For the first time, professionals will have the opportunity to register within the DNS in a meaningful fashion.� The initial rollout of doctors, lawyers and accountants will have a first and unfettered opportunity to register within the .pro domain.� That opportunity will not be extended to the public at large, but will be limited to professionals who have been qualified to practice within their respective professions. More than 94% of over 1000 consumers surveyed thought that these designations would help them find what they were looking for on the Internet, or at least narrow the search.� Those consumers overwhelmingly selected doctors, lawyers and accountants as the professionals they expected to find registered at .pro.� Consumers also included architects, engineers and financial planners as professionals they would like to look for on .pro. It is our belief that the .pro TLD will become extremely popular.� Where the .com TLD now restricts professionals from distinguishing themselves, .pro with our initial TLD subdomains will help professionals in the medical, legal and accounting services.� As these initial subdomains prove successful, and with ICANN approval, additional .pro subdomains would be developed to foster further segmentation within the professional community.� For example, new .pro subdomains could be established for professional areas such as engineering, architecture, and psychology. � Inspiring trust. The .pro TLD with its very name and the power of the experienced and professional companies backing its introduction will inspire trust within the professional sector using it and the consumers searching through it. Further, companies and individuals registering with a .pro TLD will be required to produce evidence of professional qualification and/or membership of a professional association. Consumers will know that someone registered in .law.pro has, for example, received a license to practice law or is a member of a bar association.� As registrations will take place every two years at a maximum, the consumer will know that the qualification is current.� In this way the .pro TLD will inspire greater consumer confidence in finding and using services on the Internet. � Acceptance in multiple languages. The .pro TLD has a recognition value in Spanish, French, English, Italian and Portuguese. � Established business areas. These first three .pro subdomains have been chosen deliberately with a view to stability.� Each of these professional sectors, medicine, law and financial services, are traditional business areas with internationally accepted accreditation requirements and associations.� Most countries have domestic governing bodies in each area. � Familiarity with self-regulation. Professionals in these industry areas have a tradition of developing rules of self-governance and both working within those guidelines and policing their industry area for unscrupulous activity. � Need for Internet-based activity. Professionals in these industry areas have a great need for Internet-based business activity, including communication, product development and sales, and overall marketing. Where there are greater opportunities for professionals to distinguish themselves on the Internet, we believe the professional community will come flocking. � Improved access.� The consumers searching the .pro TLD for professional services will find their targets more easily and with greater accuracy. � Solid marketing opportunities.� Each of these professional areas have established associations and other networking groups that offer the opportunity for joint marketing initiatives, current and accurate mailing lists and other relatively clear communication lines with which to promote the new TLD to professionals and consumers. � Intellectual property protection.� An additional benefit of the .pro TLD is that it will protect intellectual property.� A restricted TLD inherently narrows the category of potential registrants.� The target business sector is a class of trusted professionals, who are far less likely to engage in cybersquatting, particularly as they would not want to compromise their professional relationships and reputations.� Finally, we expect fewer trademark interests in the .pro TLD than in many other TLDs since most individual and firm names are not registered trademarks.� We believe fewer registration challenges will arise due to .pro registrants minimizing the burden on the UDRP system.� But even given these benefits, we have provided for enhanced IP protection as described in detail in our responses to questions E5-E7. E3. Describe the naming conventions and structure within the TLD. E.g., will registrants have names registered at the second level (directly under the TLD, as in registered‑name.com), or will the TLD be organized with sub‑domains so that registered domain names are created at a lower level (as in registered‑name.travel. com)? And as these new TLDs prove successful, geographic or professional delineations can be added to our TLD subdomains to further differentiate professions in the same or different professions. The cpa.pro TLD subdomain would apply to those markets internationally where a chartered public accounting certification is recognized for accountants;� Other subdomains will be established to accommodate accounting professionals accredited by other certifications. E4. Describe in detail the policies for selection of, and competition among, registrars. 1. Will domain‑name holders deal through registrars, directly with the registry operator, or some combination of the two? Registrars will continue to be the interface with domain name holders.� The registry will offer a global service to ICANN-accredited registrars. 2. What are the respective roles, functions, and responsibilities for the registry operator and registrars? � Establish a set of .pro restrictions (in coordination with professional associations, ICANN, and the Advisory Board (For a description of the Advisory Board, please see E10 below)), including an easy to use menu of qualifications, which will be part of the registrant record. � Comply with the UDRP or other applicable dispute policies, including providing for registry hold or take down of domain name registrations as appropriate. � In addition to a query-based access that would provide more information than currently available in the gTLDs, RegistryPro intends to build improved searchability tools for use by intellectual property and law enforcement interests, and such others as may be determined with ICANN and the Advisory Board. � Provide documentation and tool kits to facilitate communication with the registry using RRP. � During the sunrise period, information regarding the registrant�s trademark or service mark. � Collect� evidence of registrant�s professional qualification. � Update the database per changes in registrant�s information, transfers, deletions, renewals, or other commands. � Provide an interactive web page and centralized Whois service, with public query-based access to a real time updated database. � Provide a domain name lookup capability. � Require registrants to comply with ICANN and RegistryPro policies. � Provide a dispute resolution policy and require registrants to comply with it. In case of challenges of a registrant�s qualification as .pro registrant, require such registrant to produce evidence, take down such registration if such evidence is not produced, and place registration on hold in cases of dispute. � Comply with the UDRP or other applicable dispute policies, including placing domain name registrations on hold or taking them down as appropriate. � Provide registrants with technical, billing, and other customer support. � Pay registry fees in a timely manner. � Provide registrants with reasonable notice of upcoming expirations of registrations. � Comply with the laws and regulations of their jurisdictions. � Provide query-based searches and bulk data access as required in the ICANN Registrar Accreditation Agreement and other ICANN consensus policies, and modeled on the NSI-Registrar License and Agreement. � With a centralized Whois database adding security to .pro registrants, data storage at the registrar level will be less important. � Release domain name registrations in case of non-payment by registrant or expiration of registration term to prevent hoarding. 3. If registrars are to be employed, how and by whom will they be selected or accredited? All registrars will be eligible to register professionals in the .pro TLD as long as they are ICANN accredited and agree to the policy and business requirements in the .pro TLD agreement, which would be crafted to reflect this application and ensure the stability trustworthiness and superior standards of the .pro registry.� Equivalent access for, and fees to, all registrars will be guaranteed in order to create a level playing field. 4. If the number of registrars will be restricted, what number of registrars will be selected? The number will not be restricted. 5. Have the qualifying registrars already been selected? All ICANN accredited registrars will qualify to apply to become a .pro registrar.� As long as a registrar agrees to the .pro TLD policies, as agreed with ICANN, a registrar will qualify to register professionals in the .pro TLD. 6. On what basis will selections among those seeking to be registrars be made, and who will make them? 7. If registrars are to be used, what mechanisms will be used to ensure that TLD policies are implemented? RegistryPro will help ensure protection of registrants by including in its agreements with registrars policies regarding the restricted nature of the .pro TLD and other policies designed to set best practices.� These will be based on the experience of Register.com and Virtual Internet, guidance from the Advisory Board (See E10 below), and in coordination with ICANN.� The registry agreement will be enforced by an independent dispute resolution provider, modeled on the UDRP and on the precedent in the ICANN Registrar Accreditation Agreement, Section II.P.� Such arbitration could also be used to enforce the ICANN Registrar Accreditation Agreement and other consensus policies. E5. Describe the policies for protection of intellectual property. � Second, .pro is aimed at professionals, most of whom are individuals and will register their names.� There are fewer .pro domain names that will be subject to a registered trademark or service mark, minimizing the burden on the UDRP. � Finally, the market for .pro domain names is focused and segregated, so that there is a reduced market for resale of such names. RegistryPro will be governed by the UDRP and require .pro accredited registrars to comply with the UDRP.� For further details, please refer to our response to question E6.1. RegistryPro also proposes a pre-registration phase (sunrise period) to provide adequate intellectual property protection for registered trademark and service mark holders. For further details, please refer to our response to question E5.2. RegistryPro also proposes providing a Whois Plus database and accessibility. For further details, please refer to our responses to questions E5.6 and E7. The registrars to this registry will be required to comply with the established policies of the UDRP.� Further, the sunrise pre-registration period will limit infringement on intellectual property rights.� For further details, please refer to our response to question E5.2. RegistryPro will operate a centralized shared Whois system that incorporates the information found in the gTLD Whois and additional information to identify a registrant (see Whois results in Figure 2 below).� RegistryPro will also offer query-based and Boolean-based access and searchability that is at least as complete and robust as that of the current gTLDs, with plans to build enhanced search capability.� The enhanced capability is being built to address the specific interests of the intellectual property community.� All in all, RegistryPro is proposing to immediately offer Whois Plus, with extra capability in the future. For further details, please refer to our responses to questions E5.6 and E7. � The material textual element(s) (i.e., the word portion of their marks) as a domain name in the TLD. � These domain name pre-registrations would be confined to a single registration corresponding to a trademark. In order to ensure that the pre-registration period is used as it is intended only for trademark protection, registrants will be required to provide the registration number, date, and jurisdiction for their trade or service mark, and such information will be published as part of a registrant�s Whois record. � If a sunrise registration is challenged on the basis of not owning a registered mark, the purported owner must produce a valid trademark registration document.� Challenges will be governed by the UDRP. � If a sunrise registration is challenged on the basis of being unqualified for the .pro restrictions, such challenge will follow the procedures outlined in our responses to questions E17-E21 below. � During the challenge, the registrar must place the registration on hold. � Standing to challenge a registration during sunrise period will be open to help ensure policy compliance. � If the challenge is successful but the challenger does not hold a superior registered trademark, the domain name will be released into the open database. � If the challenge is not successful the original registrant retains the name. RegistryPro contemplates a balance to protect both consumers and registrars. 1. The sunrise pre-registration period provides significant protection against abusive registrations.� For further details, please refer to our responses to questions E5.2 and E5.6. See Figure 2 in our response to question E5.1. � during the sunrise period, information regarding the registrant�s trademark or ���������������������������� service mark. 6.� The .pro restrictions are governed by internal and external mechanisms to minimize registrations by unqualified registrants. Please refer to our responses to questions E17-E21. � No hoarding:. In general, registrations may only be held by registrants who are independent of registrars.� Domain name registrations that are expired must be released. Registrars may not register domain names on their own behalf, or on behalf of any director, officer, employee or agent of a registrar. There would be an exception for� registration on behalf of a registrar�s legitimate interest.� For example, if a professional association becomes an accredited registrar, it may register its own name in .pro . � No frontrunning: Registrars shall not engage in anticipating a consumer�s preference for a domain name (via sniffing of Whois data or other processes) and subsequently registering such domain names on behalf of the registrar, or any director, officer, employee or agent of a registrar. � Enforcement: RegistryPro will require all registrars to agree to the registry policies and to comply with ICANN policies in order to participate in the .pro TLD. �Compliance with the terms and conditions of the registry-registrar agreement will be enforced via a trusted independent arbitration mechanism, including the providers approved to provide UDRP services.� For a model, please see the ICANN Registrar Accreditation Agreement, Section II.P and the UDRP. The new registry will comply with all applicable trademark and anti-cybersquatting legislation and arbitration mechanisms, including the UDRP, and will require compliance by registrars.� Upon notice of a complaint filed under applicable intellectual property laws or the UDRP, the registrar will send� a hold command to the registry, which will place such domain name registration on registry hold until resolution of the complaint. A registrar and the registry will comply with the UDRP or court decision. RegistryPro intends to be mindful of public concerns regarding the openness and availability of the domain name system.� The policies described in E5 appropriately balance those concerns with protection of intellectual property interests. From the start, RegistryPro will more than match the current gTLDs� Whois accessibility.� For� a technical description of the Whois system, please refer to our response to question D15.2.8. RegistryPro will operate a shared registry system with a centralized Whois Plus database. � RegistryPro will incorporate on a real time basis new and updated information provided by registrars. RegistryPro will publish the data currently found in the gTLD Whois records, plus additional information, as identified in E5.3. Hence, RegistryPro will offer a comprehensive, up-to-date and reliable source of .pro data. � RegistryPro will also offer improved query-based and Boolean-based access and searchability. From the start, the completeness and robustness of the searches will match that of the current gTLDs.� Moreover from the beginning, the additional information required by RegistryPro will be visible in the searches.� This policy will help enforce the .pro restrictions as well as enforce trademark protection. � Bulk access requirements will be modeled on those in the ICANN Registrar Accreditation Agreement and the ICANN-NSI Registry Agreement.� Registrars will have the capability to comply with the privacy laws and regulations of their jurisdictions, if so required, by sending a request to the registry to mask certain private information.� The registry will work with ICANN and its Advisory Board (See E10 below) to ensure a proper balance between such legal requirements and the goals of providing appropriate access to information. E6. Describe the policies for domain name and other dispute resolution. E6.1. To what extent are you proposing to implement the UDRP? RegistryPro proposes full compliance with the established policies of the UDRP, including during the sunrise period.� Please refer to our response to question E5.2. With the goal of enforcing the .pro charter and ensuring that it is a mark of the professional sector that it serves, RegistryPro proposes leveraging the experience provided by the UDRP and the model in the ICANN Accreditation Registrar Agreement, Section P.II.� The idea is for an independent, trusted dispute resolution mechanism to help enforce .pro registrant restrictions and other registry policies as are specified in the registry-registrar agreement and as may be added from time to time per guidance from ICANN or the Advisory Board (See E10 below).� The arbitration mechanism would provide a strong, independent enforcement mechanism.� For further detail, please refer to our responses to questions E17-E21. E7. Describe the proposed policies on data privacy, escrow and Whois service. RegistryPro shall deposit into escrow all registry data on a schedule to be agreed with ICANN (suggested weekly for a complete set of registry data and daily for incremental updates) and in an electronic format mutually approved by RegistryPro and ICANN. The escrow shall be maintained, at RegistryPro�s expense, by a reputable independent escrow agent.� In preparation for the possibility of being awarded the bid, RegistryPro has initiated a process of� seeking bids from escrow agents. Attached are examples of incoming bids, redacted to protect confidential and commercially sensitive information. The use of the escrow data will be limited to verification that the deposited data is complete and in proper format to protect the privacy of the data.� The data would be released to ICANN or the United States Department of Commerce upon termination of the registry agreement or in the event of an applicable court order or subpoena. The registry will also encourage registrars to deposit into escrow all registrar data on a similar schedule.� But as the registry will have a centralized shared database, including all Whois records listed herein, the registry�s escrow commitment will ensure the availability of accurate records in case of possible registrar failure. The registry will operate a centralized shared Whois Plus database. The database will be accessible to query-based and Boolean-based searching. Its Boolean-based search capability will be significantly enhanced in the future.� For further details, please refer to our responses to questions E5.6 and D15.2.8. RegistryPro�s goal is to help protect intellectual property interests against cybersquatting and allow queries that further the goal of public openness, while protecting registrants� private information as contemplated in and protecting registrants from spamming or other unethical and inappropriate commercial practices.� There appears to be a growing movement, that began in Europe, to protect personal data provided on the Internet.� At the same time, there are legitimate reasons to release data, such as to protect intellectual property rights or enforce a court order or subpoena.� RegistryPro�s goal is to balance these competing concerns. RegistryPro proposes to provide for query-based access and Boolean-based searches for violations of trademarks as described in our response to question E5.3.� Clearly, RegistryPro would accommodate court orders and subpoenas and similar law enforcement-related orders. For bulk access, RegistryPro and the registrars registering on .pro TLD will comply with the requirements of the ICANN Registrar Accreditation Agreement and the ICANN-NSI Registry Agreement and other ICANN consensus policies. E8. Describe variations in or additions to the policies for billing and collection. RegistryPro is going to establish practical billing policies, which are easy for registrars to use, ensure stability of registration services, protect registrants, and encourage competition.� There will not be a fee to join the .pro TLDs. The core billing processes are ones with which the RegistryPro partners and other registrars are familiar, and are therefore simple to use.� For the current model, please refer to the NSI-Registrar License and Agreement Sections 5.2-5.4. � The registry will collect a letter of credit from each registrar, from which the registry can withdraw funds in the event of non-payment by that registrar for domain registrations. � The registry monitors the volume of registrations daily. If the monetary value of registered names exceeds 80% of the letter of credit, the registrar is provided appropriate notice. The registrar can increase the letter of credit or make a pre-payment to maintain an acceptable credit balance. Once the credit limit has been reached and unpaid past due balances remain, the registry shuts off the registrars ability to register more names. � At the end of each monthly billing period, the registry compiles registration data for each registrar. An invoice is created and the data is made available either by sending paper or electronic documents, or by posting the data on a secure FTP site. � The registrar normally pays the invoice in full upon receipt. The registry updates the registrar�s account and sends a confirmation of the registrar's credit balance. � In some cases, registrars may make partial payments pending minor disputed amounts relating to a small number of names. In these situations, the registry works with the registrar to answer questions and have outstanding invoice amounts paid. � If a registrar does not pay, the letter of credit can be drawn upon to pay outstanding amounts.� If the letter of credit limit has been reached, the registry shuts off a registrar�s ability to register names. � The precautions (described above) taken to prevent a registrar from registering new domain names if the registrar is delinquent serves several goals.� A registrar�s non-payment of registrations may indicate their impending bankruptcy.� Hence cutting off a registrar will limit the number of registrants affected by a registrar�s failure. Strict billing policies establish disincentives to a registrar�s speculative and other irresponsible business practices. The registry will also require registrars to post a surety bond to indemnify the registry and its employees from all costs and damages which it may suffer by reason of a registrar�s failure to otherwise indemnify the registry.� Please refer to the NSI-Registrar License and Agreement Section 2.14. E9. What registration services do you propose to establish charges for and, for each such service, how much do you propose to charge? For background, please refer to the NSI-Registrar License and Agreement Sections 5.2-5.4.� For the most part, RegistryPro proposes to continue the current system, except for improvements, as indicated below.� Moreover, RegistryPro proposes charging a competitive registration fee -- no higher than the current .com registry fee. � Registration -� $6.00 (plus VAT where applicable), per one year, per domain name.� RegistryPro�s business plan has established this rate for the company to maintain itself as a competitive, stable and sustainable operation. � The term of registration will be a minimum of one year and maximum of two years. � There will be a 5-day grace period to delete a registration.� If a domain name registration is deleted during the grace period, the registry will credit the registrar�s account in the full amount of such deletions. � Renewal - $6.00 (plus VAT where applicable), per name, per year, provided that the total registration term does not exceed two years. � The registry will, however, send reasonable notice to registrars in order to ensure that the domain name is not allowed to inadvertently expire and be registered by someone else.� The registry will also provide a 5-day grace period after expiration of a domain name registration in order to provide an opportunity to a registrant to reinstate the expired name. � If a registration is deleted or not renewed, there will be a 5-day grace period to allow reinstatement by the registrant.� During this grace period, the domain name registration will be on hold.� At the end of the 5-day grace period, if not reinstated, the domain name will be immediately released back to the open market and the registrar will be reimbursed the registration fee. � By placing the maximum registration term at two years, the registry will maintain its restricted and consumer-trusted qualities.� At renewal, all .pro TLD registrants will resubmit their qualifications to the registrar, showing evidence of their continued good standing within their professions. � Searches or look ups on the Whois database equivalent to the current searching capacity on the .com registry. � Consumer education (brand positioning) around the .pro TLD. � The restricted registration process, supporting professional standards for the .pro TLD. � The staff� to liaison with ICANN and the RegistryPro Advisory Board and coordinate policies and activities with professional associations. � The development of products (proprietary software and other services) to help registrars communicate with the registry and market the .pro TLD. � The centralized database, 24/7 technical support and backup systems that will ensure no downtime for the .pro TLD.� This system will respond in real time to registrants� electronic input and will reduce the burden on the registrars. � The discrete roll out of this product to a limited target market, resulting in a smaller market share potential than an unrestricted TLD. In addition to providing a premier service at the base fee, RegistryPro intends to develop future value added services and products, which it may offer to registrars for an additional fee.� Providing these additional services will require additional staff and technical resources and therefore will require additional fees.� RegistryPro seeks to maintain an affordable base registry fee where the fundamental services of the .pro TLD are easily available to all. RegistryPro is creating an Advisory Board to contribute to the development and implementation of the new .pro TLD.� This new board will assist in identifying relevant professional associations, help identify new subdomains, and help determine and approve each sub domain's criteria and rules.� The board will advise the registry in general on general business practices, policies, and technological issues, with the goals of improving the registry�s services, ensuring its stability, ensuring its compliance with ICANN policies and helping to set best practices for the registry sector. � representatives from ICANN constituencies. Identification of members of this board has begun. As of October 2, 2000, the individuals identified in Appendix D__ have expressed their interest in joining the Advisory Board. Since the more competitor registrars there are, the less profit RegistryPro must distribute, there is a natural incentive to attract competition.� Since the parent companies are giving away a portion of their registry profit, they are, in effect, paying registry fees, like all .pro competitor registrars.� Since, the parent companies thus incur a registry fee, there is a disincentive to hoarding. � Support for ICANN policies. RegisteryPro will roll out the .pro TLD following approval of this application by ICANN.� Upon approval, RegistryPro�s management and operations team will commence negotiations with ICANN to determine best practices and systems to make the .pro TLD part of the existing DNS. This team will be composed of experienced staff from the parent companies as described in Section D (see our response to question D9). We will hire staff, rent or purchase facilities and equipment and establish the systems necessary to build and maintain RegistryPro.� We will develop proprietary software, roll out our business and marketing plan and begin the registration process with the initial sunrise period building toward full registration. E11. Describe all policies (including implementation details) that you propose to follow during the start‑up phase of registrations in the TLD. 1. How do you propose to address the potential rush for registration at the initial opening of the TLD? RegistryPro will establish an initial period for registering domain names in a manner, that does not unfairly benefit any registrar or registrant. � During this initial period, each registrar will be allowed to periodically submit lists of registration applications, on a rolling basis. � During each cycle, the application will provide for each registrar to be picked at least once, but no more than once, before the registry begins the next cycle. � Each cycle will proceed according to a new random order picked by the application. � If a domain name is already taken, the application will continue to randomly pick from that registrar�s list until there is a successful registration by that registrar, before proceeding to another registrar. Preregistration will not be honored and in fact, would be impossible to satisfy. In order to ensure stability to the registration process, the five-day grace period described in our responses to questions E8 and E9 will not apply during this landrush period.� No changes or updates to the registration information will be permitted during this land rush period, including transfers between registrars or registrants. 2. How many requested registrations do you project will be received by the registry operator within the first day, week, month, and quarter? RegistryPro is rolling out a new product with the .pro TLD.� Not only is it a new product, but the restricted domain name area is untested and country code or non-commercial (e.g., .edu) TLDs provide little relevant historical data upon which to draw comparisons and make projections.� The system we will build will have an initial capacity to handle 100,000 registrations per day.� RegistryPro believes this capacity will more than meet the initial potential demand for the .pro TLD. What period do you believe should be considered the TLDs "start‑up period," during which special procedures should apply? The appropriate length of this period will be determined in combination with ICANN and the Advisory Board (see E10 above) and upon evaluation of the more extensive consumer research we plan to conduct to determine the volume of the landrush. Artificial limits would stymie the growth of the registry and frustrate consumer demand, and may unfairly and unreasonably harm some classes of registrants.� Instead, the system described in our response to question E12 will regulate initial demand. RegistryPro is concerned that raising prices would unfairly penalize smaller or non-profit registrars and registrants.� We have substantially addressed this concern through the use of a sunrise period, a landrush period, and the professional qualifications requirement of all registrants.� We believe these measures leave in place a level playing field for all registrants and registrars.� See our responses to questions E12 and E17-E21 for more details on our plans to control the initial registration process. E15.� Will you offer any "sunrise period" in which certain potential registrants are offered the opportunity to register before registration is open to the general public? If so, to whom will this opportunity be offered (those with famous marks, registered trademarks, second‑level domains in other TLDs, pre‑registrations of some sort, etc.)? How will you implement this? RegistryPro will offer a sunrise period to holders of registered trademarks.� Please refer to our response to question E5.2. The .pro TLD will be divided into specific subdomains that correspond to professional sectors.� In line with ICANN�s wish to have a controlled roll out the new TLDs, we propose that a limited number of subdomains are issued initially, so that the� process can be fully analyzed and understood. We recommend beginning with .law, .med, and .cpa.� Further roll out will be based on market research, the guidance of the Advisory Board (see E10 above), and coordination with the corresponding professional associations and ICANN.� The .pro TLD itself may be made available as an umbrella TLD corresponding to the introduced sublevel domains. Working with its Advisory Board and professional associations around the world, RegistryPro will develop appropriate guidelines for the registration process to the .pro TLD.� Specific evidence of professional credentials will be required of all registrants showing their qualification for the professional area in which they wish to register. (b) the qualifications are serious and consistent and support the trusted nature of the professional class � the menu will specify the qualification choices. The intention is to craft criteria which will emphasize the �trust� concept of the brand (.pro) and provide comfort to the users of the brand. Registrars would be responsible for receiving a registrant�s evidence of qualification.� If an exceptional case arises,� it will be reviewed by registrars pursuant to policy developed by RegistryPro with guidance from the Advisory Body, the appropriate professional associations, and ICANN. iv. An entity or association that provides legal services and whose employees or members satisfy one of the above criteria. v. An entity or association that provides medical services and whose employees or members satisfy one of the above criteria. iv. an entity or association that provides certified accounting services and whose employees or members satisfy one of the above criteria. For all of these, continued good standing as a member of the profession will be required.�� This will be ensured by limiting the registration term to 2 years and requiring requalification each time. Applications can be from individuals, entities, or associations that are members. As a result of these plans, the potential market for applications, the usefulness of .pro, and the overall commercial viability of the registry will be maximized. Eventually if RegistryPro introduces narrower subdomains, such as fr.med.pro, the qualification process would likewise become more specific. Figure 5 below shows a portion of what the RegistryPro registration sign up page might look like. Registrations will be made on a first come, first served basis. A registrant would be allowed to register for multiple domain names.� For example, a lawyer named John Smith may register both JohnSmith.law.pro and his law firm, SmithandDoe.law.pro.� Likewise a registrant may register on all of the subdomains that he is qualified to join. A professional who is both a C.P.A. and a practicing attorney may register both as JohnSmith.law.pro and JohnSmith.cpa.pro. (c) The registrar will confirm to the registry receipt of the evidence and the qualifications would appear in the Whois record of the registrant. (b) RegistryPro proposes looking to independent arbitration providers, such as those involved in the UDRP, for adjudication.� Professional associations may have an interest in being one of the alternative venues for such challenges, and would be well-suited to doing so. (c) Upon notice of such challenge, the registrar must place the registration on hold (prevent its transfer) and request the registrant to respond to the challenge. (d) If after 10 business days the registrant has not responded, the registrar will take down the registration. (e) If the registrant responds as contemplated in (c), the registrar will comply with the arbitration decision, or remove the hold status if notified that the complaint is dropped. (f) The registry will reflect changes in the registration�s status in the centralized database. RegistryPro�s Advisory Body (please refer to E10� for further details) will provide guidance for developing and continually refining both the .pro restriction criteria and the enforcement mechanism.� The Advisory Board will assist in identifying and coordinating with the relevant professional associations to help determine and approve each subdomain's criteria and rules. Additionally, RegistryPro would allow professional associations or other verification agencies to offer a verification service.� For example, not only would a registrant have to provide evidence of, for example, passing a medical board, but the association would also certify that fact.� This enhanced verification could be posted by the registrant.� But as it would significantly slow down and complicate an already multi-step registration process, it is not contemplated as a registration requirement. Denial of registration may be appealed through the arbitration mechanism established to review challenges to registrations. Please see our response to question E19 for further details. Please refer to our response to question E19. Please see our responses to questions D13.1.5 and� D13.2.4 regarding our mission and marketing plan, respectively, for further details and explanations as to the benefits of this distinction. The .pro TLD will serve professional sectors around the world.� The .pro TLD will be segregated into specific TLDs such as .cpa, .law, .med, etc.� The idea is to begin with a testbed of the more traditional, global professions, and branch out in a measured manner to other professions.� The DNS is not serving this sector at present, see below. Also, please see our response to questions D13.1.5 and� D13.2.4 regarding our mission and marketing plan, respectively, for further details and explanations. The .pro TLD will establish TLDs tailored to specific professions.� This will become a directory to professionals around the world.� It will help consumers locate professionals around the globe. The Internet has given the world the technology for better communication around the world.� The .pro TLD will provide the unique service for a consumer in Japan to find a doctor in New York, or a businessman in London to find a lawyer in Beijing.� No other tool is presently available that is comprehensive, robust, nor current enough to be truly useful. In addition to our response to question E25, RegistryPro is committed to an ambitious marketing and advertising campaign (See our response to D13.2.4), which will benefit the entire DNS by educating the general public about the value and role of domain names.� Furthermore, RegistryPro will establish best practices from the technology, business and policy standpoints which will in turn raise the standard for other registries. The .pro TLD will enhance competition by offering a popular service to broad sectors.� Professionals are already some of the most active Internet users.� We believe this group will quickly recognize the value of the .pro TLD to their business activities.� We believe these professionals will be extremely attracted to the capacity for our system and the .pro TLD to engender trust among consumers looking for professional services within the .pro TLD. In market research conducted by RegistryPro in the United Kingdom and the United States, over 94% of consumers polled expressed interest in seeing a TDL at some level.� 70% of that majority were very or extremely interested. Ten in-depth interviews revealed that key decision makers felt on balance that .pro would serve as a beneficial and reliable way to find professionals on the Web and will promote search engine efficiency. This popular TLD will bring competition to the registry sector and enhance consumer choice. RegistryPro�s JV partners have created a financial structure that promotes competition (see our response to question E10 regarding the community refund) and ensures that assets of the registry would not be utilized to unfairly advantage them to the detriment of other registrars in the .pro TLD. (f) whether the centralized Whois Plus database will improve the DNS and address intellectual property and consumer concerns. � Compare current monthly registrations throughout the DNS before and after the introduction of the .pro TLD to determine its ability to attract new registrants. � Survey registrars to evaluate their experience registering names within the new TLD. � Survey registrants and consumer users to evaluate the value-added or increased difficulty to Internet navigation after the .pro TLD has been introduced. � Assess the use of DNS security extensions to evaluate their adoption within the Internet community. � the ability of consumers to navigate new naming structures with sub-domains, and in the future, geographic and other sub-domain designations. � whether it better meets intellectual property and consumer needs. As described above in the Policy section of the application and in more detail in the marketing plans of the Registry Operator's Proposal, we have identified a need within the professional services industry that the current DNS does not meet. Professionals in many industries are underserved by the current system making it difficult for them to distinguish themselves on the Internet.� Further, consumers are less likely to find and use services that are not clearly differentiated and trustworthy. A .pro TLD will uniquely demonstrate that competition can be enhanced without losing stability within the DNS. Furthermore, stability will be guaranteed by the tech expertise and resources that the three entities bring to bear.�� For further detail, see Section D, III, Technical Plan. Please see the hardcopy submission of this application for a complete and original signature page.